It is the blueprint for global cooperation. One that enables a multinational partnership and advances shared goals in space exploration. Kanai will travel into space in 2017 aboard Russia’s Soyuz spacecraft. He will stay at the International Space Station for about six months from around November of that year. I am very proud that I was commissioned for such an important mission. I am determined to work hard through training and aim to proudly report space science and experiment results to the Japanese people in two years through contributions to breathtaking and innovative experiments that will surprise world scientists and researchers. NASA astronauts on the International Space Station eat red romaine lettuce, which they freshly harvested from the orbiting lab’s vegetable plant growth system. The space garden snack marks the first time NASA had cleared its astronauts to eat what they grew. Before eating, they clean the lettuce with citric acid-based sanitizing wipes. The three save a few leaves for their Russian cosmonaut crewmates, two of whom are out on a spacewalk. Half of the harvest is frozen on the station so it can be returned to Earth for scientific analysis. Kelly tweets footage of the Aurora Borealis, otherwise known as the Northern Lights, taken just before sunrise from the International Space Station, on the 141st day of his #yearinspace mission. 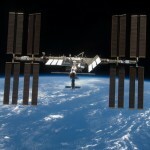 The European Space Agency says that the International Space Station should be opened up to astronauts from India and China. We need to get away from the principle of being a closed club. The Company creates the world’s largest tire track message using 11 Genesis sedans on Delmar Dry Lake in Nevada. The message is from 13-year-old Stephanie, whose father (whose name is undisclosed) is an astronaut on the Space Station. The images measures 59,808,480.26 square feet.